A graduate of the prestigious New England Conservatory of Music and a virtuoso multi-instrumentalist with over twenty years professional performance experience, Tim has been immersed in a variety of musical styles since he first began classical piano lessons at age seven. While working as a pianist and bassist in Boston, Tim delved deeply into the traditional Irish music of his youth, studying with renowned composer Michael O’Suilleabhain and master flutist Meabh Ni Fhuarthain. This work led him to the mandolin, and also to New England Conservatory, where he studied classical mandolin with Robert Sullivan, Jewish traditional music with klezmer guru Hankus Netsky, and modern improvisation with Ran Blake, receiving his Masters degree in 1997. While at NEC, Tim first heard the recordings of the great Brazilian choro mandolinist, Jacob do Bandolim, which led him to study this music with Brazilian choro masters Paulo Sa and Hamilton de Holanda, and with the legendary American mandolinist Mike Marshall. Tim currently lives in Portland, Oregon and performs choro and gypsy jazz with Rio Con Brio (www.myspace.com/rioconbrio) and Clambake, Irish music with The Yellers, Portuguese fado with Pacific Fado, classical and Latin music with Toscana, and original compositions with Terracoustic. 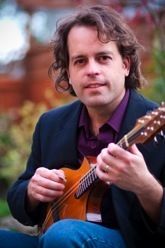 His study of Brazilian and Irish music, combined with his many years as a bassist and pianist have helped Tim synthesize a personal style on the mandolin which is harmonically advanced, rhythmically diverse and brimming over with sparkling ornamentation and romantic intensity.